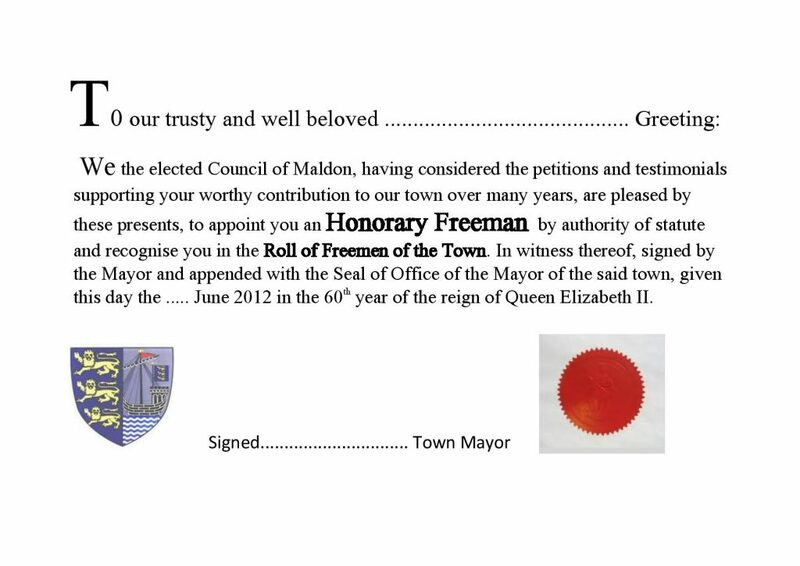 Maldon Town Council will, in special circumstances, where the criteria is fully met, award to an individual the title of “Honorary Freeman of the Town of Maldon”. This honour will not be awarded annually but only on rare and exceptional occasions. Nomination alone in no way implies that the Honour will be granted. A nominee will have given extensive and distinguished service to the community that goes beyond purely the occupational but will include service to organisations or groups of a largely voluntary nature. The nominee must have made an outstanding contribution to the Town such that the nominee’s collective efforts can be seen to stand above the contributions made by most other people. (a) Significant contribution of the person’s time in serving members of the community for the improvement of their welfare. b) The promotion, achievement and or delivery of community services in which a real personal role and contribution is made. A guideline for duration of ‘service’ will be 25 years which can be tallied as an accumulation of service in combined roles/capacities in different organisations. Although four sections are included in this application for evidence this does not imply that they must all be used. Any resident of the Maldon Town Electoral Register may make a nomination which will need to be seconded by a resident of standing similar to those required to countersign passports.